Super Cruise has been available on 2018 CT6 models produced on Sept. 6, 2017 and later. When I got the chance to try out the CT6, I was unequivocally blown away by the technology and the comfort that comes standard with this vehicle. Besides being one of the safest vehicles on the road due to the advancements, it’s also extremely comfortable, with features such as heated and massaging seats in both the front and rear. I don’t believe I’ve experienced this level of joy while driving since I was a teenager. My last night with the car, I didn’t have any place to go. But I got on the freeway, set the Super Cruise and let it go. I wanted to see how far I could go in the middle lane before the vehicle had to disengage from Super Cruise. For the most part, the driver must intentionally steer the wheel (for example, when changing lanes) to pause the system. I went about 55 miles before I disengaged the system myself in order to exit the freeway and turn around to go home. At one point, I hit a rough stretch of typical Michigan freeway, but the car stuck to the road like glue. I was completely relaxed, assured that the vehicle was centered between the lines. Admittedly, that took a little bit of adjustment because, upon initially engaging Super Cruise, I was convinced I was drifting to the right. My palms sweated for about the first 15 minutes I used the technology that first day, but it quickly proved itself trustworthy. My driving is much better when I’m using Super Cruise. I’m going the speed limit or just above it (by choice — drivers can engage Super Cruise at any speed up to 85 mph), I’m not tailgating, and I’m not drifting. Obviously, I try not to do any of those things when I’m in control of the car, but I am only human, unlike Super Cruise, which began to feel like my robot friend. By the end of the trial, I was starting to feel like the car was like Kitt from “Knight Rider” — I felt the urge to name the car, which I have never done with any of my owned vehicles. Some of the small joys in this Cadillac include a mute button. Why does every car not have one? Another hit: a heads-up display that gives the driver the perfect amount of information, not too much and not too little. If you aren’t familiar with heads-up, you will be soon. It’s creeping into more and more vehicles, not just high-end models: an image superimposed on the windshield that only the driver can see that includes info like the speed limit, what speed the vehicle is driving, the next navigation direction, etc. It also has adaptive cruise control, which is showing up in more and more models. It’s like regular cruise control except that it slows down if you come up on a slower-moving vehicle and then speeds up again once that vehicle is no longer there, all without the driver having to hit the brake or gas. Other surprise-and-delight features include a center console that opens from either side, a perfectly-sized crevice near the cupholders for one’s cell phone, and a glovebox that opens with the touch of a button on the center screen, whether or not the vehicle is turned on. The wipers come on automatically when there’s a slight amount of rain. This car was very intuitive to learn; I didn’t have to look in the owner’s manual for a single thing. I appreciate that there are no buttons that need to be pushed to open the gas latch. It’s on a spring and you simply push on it to open it. I love that there’s no gas cap to lose. It does take 91 octane gas which is more expensive -- but if you can afford an $89,200 car, you probably can afford premium fuel. You would think after driving this car for four-plus hours each way to Northern Michigan over the weekend I would’ve gotten my fill of it. But no, here I am out with no place to go, just enjoying the ride. This is what driving is supposed to be, and the funny thing is I’m technically not even driving, thanks to Super Cruise. My only criticism is, Super Cruise is only available in a vehicle that costs nearly $90,000. Cadillac plans to roll it out across the division in 2020. And then it will migrate to other General Motors vehicles. It’s a pity it’s going to take that long. This technology could make driving so much safer if it was available at a lower price to more drivers now. I’ve discovered it even protects me from other stupid drivers on the road. If someone cuts in front of the CT6, it slows down immediately, certainly faster than human reaction. The sensors in the front of the car detected deer about 10 seconds before I saw them and they were on the side of the road, not in the roadway. My haptic seat buzzed and there was an alert on the heads-up display. This was not Super Cruise, but other sensors on the car. If you want to geek out on the engineering, here you go. The Super Cruise driver-assistance feature is made possible by precision LiDAR map data, high-precision GPS, a state-of-the-art driver-attention system and a network of camera and radar sensors. It requires an active OnStar service plan with emergency services to function. Customers can drive hands-free on more than 130,000 miles of limited-access freeways in the U.S. and Canada. The driver-attention system helps keep drivers engaged and detects when they need to pay more attention to the road. Even while using Super Cruise, drivers always must pay attention and not use a handheld device, according to the automaker. Still, Cadillac is not doing enough to promote the feature and educate potential customers about its benefits. 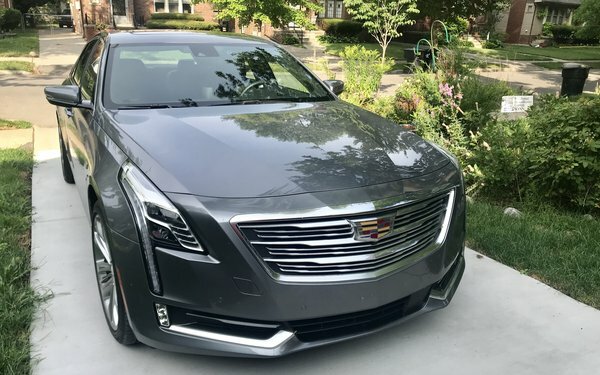 A neighbor confided that his brother recently ordered a Cadillac, but not one with Super Cruise “because he was afraid of it.” This type of reaction is more common than not, and it’s something all automakers are going to have to tackle head-on. The beauty of a system like Super Cruise is it’s completely up the driver when they want to engage it. But my guess is the more familiar customers become with it, the more they will use it -- and the safer we all will be.